Scott English and Larry Weiss wrote the song 'Popcorn Double Feature'. It was first recorded by Time Wilde in 1967, before also being recorded by The Searchers in the same year. It was later released by The Fall in 1990 for the Extricate album, which was made immediately after Mark E. Smith divorced Brix Smith. Her departure influenced more than just the subject matter of the album - it helped define part of its sound. Her background vocals and post-punk guitar, which had become mainstays of The Fall, are noticeably absent in this release. In one of the more unusual events in the group's history, she was replaced by founding member Martin Bramah, who had previously left the group in 1979 to form his own band Blue Orchids. The critical reception to Extricate was positive, with Melody Maker suggesting it was "possibly their finest yet" and NME giving the album a full 10/10. I remember Mark E. Smith playing his favourite records (Can, Augustus Pablo, The Young Gods, Napoleon the 14th) on the Mark Goodier BBC1 radio show in roughly 1991. Goodier commented that Mike Edwards of Jesus Jones was also a fan of The Young Gods, a fact he considered weird because "two people with less in common he couldn’t think of". Smith retorted: "Mike Edwards played on 'Popcorn Double Feature'". I loved both bands, but I was unaware of the connection at the time. Since then, it’s always fascinated me. How did the collaboration come about? Because no-one seems to know... Were you just in an adjoining studio? (In the scheme of Fall one-offs it seems to be only bettered by the Chemical Brothers' manager Nick Dewey drumming for them at Reading festival when they were caught short). Mike Edwards: The producer Craig Leon was working with both of us at the same time. He had one session going on in one room in The Townhouse Studio in Shepherds Bush, and another session in in another room. Not all the time I'm glad to say and I seem to recall my Fall moment was recorded on a Sunday, or some similar 'off' time. Was the recording completed in one day? Where did the recording take place? ME: I couldn't tell you how long the entire song took to record - I wasn't around for that - but my part was done in a couple of hours. It was some guitar playing so we didn't need a drawn out session for my few bars. Did you (and the band) sit down and listen to The Searchers version of the song before recording? (The thing that always struck me about the song is how Mark E. Smith makes the song his own - it definitely helps that the original is great and the lyrics are fairly off the wall). ME: No, I heard it for the first time when I walked into the studio. In fact, I've only just discovered it wasn't a Fall original! So yes, he definitely made it his own but I'd say that was par for the course for him. Did you work on any of the other recordings on the album / B-sides? ME: Nope, just that one. I think I was an interesting experiment on Craig Leon's behalf that Mark E went along with. I don't think I was ever considered as much more than a novelty in Fall world. You must have been busy in 1990. Can we just try to get the timeline correct? At the time of the recording you had released Liquidiser and you were writing Doubt - or was this 1989? In February 1990 you played for the British troops in Romania. Later that year you would release an album that sold 2 million copies. Surely you had more pressing things to be doing than working with The Fall? ME: Fighting my natural urge to be utterly pedantic I'll still have to point out a few points there; the session was done as we were recording Liquidiser - the summer of 1989, Tiananmen Square on the TV all the time. Six months later I was writing Doubt (in the aftermath of the collapse of the Iron Curtain) and on the verge of going to Romania, playing to utterly bewildered Romanian rock fans who were expecting German Heavy Metal to be part of their bright new future - no British troops there to my knowledge. It was a year later that Doubt was released. And yes, it was busy but busy with doing interesting things like playing on that session. After all, this was the kind of professional musician lifestyle I'd been chasing for years. At the time of Extricate, The Fall were probably at their largest number. Mark had broken up with Brix. Martin Bramah had rejoined the band. They were undergoing a renaissance critically. Mark had moved from Manchester to Edinburgh. The Fall had got hip collaborating with Coldcut. This timeline is correct? What was the mood in the camp? ME: I can't really comment accurately on that. I do remember the Coldcut collaboration but I really don't think The Fall needed to get any hipper at that point. It was a tangential move but not necessarily a progression in the eyes of critics. As I only met Mark E. Smith I can't say what the feeling within the band was. On the few times I've met him the mood seems to be about the same. You were a lot younger than most of The Fall. They didn’t pick on you did they? ME: Ha! I'm probably taller than all of them so no! The session was very small, just Mark, Craig and I. I was keen to please since this was a big moment for me, Mark was very quiet and withdrawn so that most of the communication about what and how to play came via Craig. He was respectful but definitely knew what he wanted. I didn't get the idea me playing on the track was the high point of his week but if Craig thought it might work and I wasn't an arse he'd go along with it and see what happened. At least that's my impression after 21 years of memory hazing. Were/are you a Fall fan? What are your favourite Fall songs and albums? Have you seen them perform live on stage? ME: Probably more of a Fall fan than Mark was/is a Jesus Jones fan! Yes, I have some Fall albums but I can't remember which and they're at home now when I'm not. They were one of those few bands that if you were a music fan in the 80s, you absolutely had to have a knowledge of. They were seen as an essential part of the development of British music in that era so even if you didn't listen to them daily, not listening to them at all was a serious omission. Seen them live on a number of occasions, usually festivals. Always enjoyed it. You were termed as indie dance - isn’t it slightly incongruous that you and not someone from the Manchester bands collaborated with The Fall? ME: It is interesting to see how history has become re-written with all this. The term indie-dance hadn't been used, or at least not coined often by summer 1989. More to the point, at that time the first Stone Roses album was only just out and listening to it you'll hear a straightforward Indie album, no dance element at all. Not that there's any problem with that. The Happy Mondays at this point were still just a funk band - an interesting and way above average one - but it was Vince Clark's remixing of 'Wrote For Luck' that provided a pretty radical change of direction. 'Fool's Gold', a year later, was really the Stone Roses' one stab at the dance side of it and by that time the Manchester thing was in full swing. If I were writing history I'd point out that Age Of Chance in 1986 were doing stuff that fully combined dance and rock, soon followed by Pop Will Eat Itself and The Shamen. Those are the bands that were the pioneers. Basically the people that came late, and in some cases pretty half-heartedly, to the party are now credited with being the be all and end all. My acid house remixes of our tunes in 1988 aren't good enough for me to complain about being written out of history ! Were you aware that The Fall’s version of 'Popcorn Double Feature' is sung in full by Johnny Vegas in the opening sequence of the latest series of the sitcom Ideal? ME: No! I'm going to have to chase that. I hope he puts the emphasis on the guitar parts. 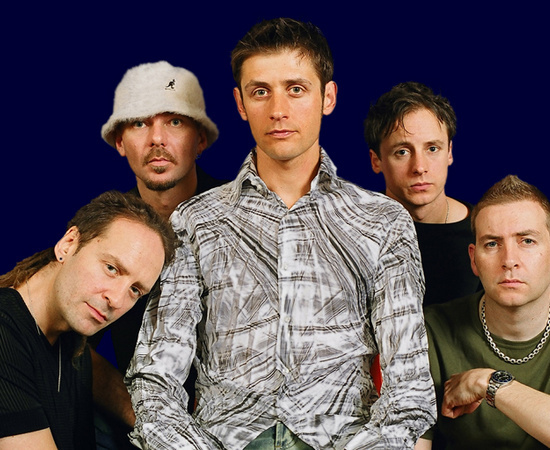 Jesus Jones as a band have remained the same guys since 1989. Did you not pick up any tips from Mark E. Smith about hiring and firing? ME: It's a good point. God knows I tried, but there was always the concern that I might not actually be the real talent in the band. In your writing and recording were you influenced by anything from The Fall - the distorted vocals perhaps? I always hear Talking Heads and Public Enemy when I listen to your band. ME: And you'd be dead right. I'd always liked the spikiness of The Fall, though, especially the guitar parts with their unconventional approach. From my experience of the session I think some of that may very well be down to Mark E Smith. The Fall have never really had a big hit; you had yours with 'Right Here Right Now'. Can it be more of a hindrance than a help? I ask this question because I feel that sometimes The Fall may have sabotaged success at times for exactly this reason. I mean, why not release 'Bill Is Dead' as a single? Why entitle it 'Bill Is Dead'? People don’t expect to hear a specific song when they go to a Fall concert. ME: Depends on whether you want to be perceived as having a solid body of work or being a 'One Hit Wonder', as I believe some in America view us. Over here we had a few other songs that could be added into the one hit lucky dip, and we have 'Info Freako' as a potential cult classic. But if I were given the choice I'd go for the One Hit Wonder and this may be because - as many suspected all along - I am simply a mercenary swine, but it's really great to be able to feed your kids on the back of American radio still playing one of my favourite Jesus Jones songs 20-years after I hurried it out in a dingy London flat. And this feeds into another question... Did the cycling stop you from doing a Kurt Cobain when massive success arrived? [Edwards is a keen cyclist and, according to the BBC, also works as a personal trainer]. Insensitively put but some people were lauding you as leading a new Beatles British style invasion - that must have been stressful. ME: Absolutely spot on. Some people are just not mentally built to be famous and whereas Bono and Liam Gallagher either are or developed the ability to cope, I couldn't and it doesn't seem much like Kurt Cobain could either. Cycling, and racing in particular, gave me something to be equally obsessive about without people criticising me for. Career-wise, developing an alter ego would have been the best move but I wasn't clever enough, and besides, I've won a few tiddly races so what do I care? In the early Food Record days did you know Blur? Were you aware that Mark E. Smith features on the new Gorillaz album? ME: Yes, I first saw Seymour, as they were then, as Food were on the brink of signing them. They were acquaintances as a result of the Food deal (Food's office at the time was one small room in Soho) but not friends. Not because, on the whole, we and they weren't likeable, just slightly different. Apparently, Alex James, in his book, recounts a fist fight between Damon and I that I was totally unaware of. So too were the rest of the band when I asked them (in case my memory of me doing something totally out of character was faulty). Mark E. Smith on the Gorrillaz album? Great idea! Were you a tiny bit disappointed when Obama overtook Hilary Clinton in the presidential nominations given that she was using your song? ME: Gutted! Although she'd already chosen a Celine Dion song (my, the company we keep) as her campaign theme tune. Since Bill used 'Right Here, Right Now' in the 90s I still have hope for Chelsea using the family favourite when her political career kicks off. What are your plans for the future? Any new material / gigs on the horizon? ME: Nope. We've reached a point where the amount of paying gig goers who want to see us versus the money required to take us all away from what we do otherwise don't match up. I say this every year, though, and we still manage to get together to play every so often. As for writing new stuff it's too time consuming for me at the moment, although I'm itching to do it again once I give up all my other time-consuming hobbies. Mike Edwards currently plays in Andrew Mueller's band The Blazing Zoos. More information on their own inimitable brand of Country and Southern music here.